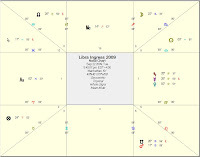 " So it be written in the stars"
With the Ingress in Libra we have, that Mercury is the Ruler of the chart for the remaining year of 2009. Moon Eclipse Dec. 31 2009 10 Cancer 14: Excites and stirs up wars. Sun Eclipse Jan. 15, 2010 25 Cap. 01: It induces the tumultuous motion of the king and causes famine. There shall be much rain and a lack of corn. There shall be much infirmities of the eyes and death in the southern parts. We shall see floods, and strong winds. It denotes joy and gladness to rich noble and great men, and their honor and preferment, but the dejection of the base and ignoble. With the Ascendant in Piscis, the US will see a lot of rain, floods and we will hear of strong winds and hurricane. The people will want to entertain themselves, and as the year reaches to a near end, they will feel that their confidence has been lost and they will feel fear, and will suffer anxiety and a sense of abandonment and lack of justice. We will hear of riots, manifestations and lawsuits will be abundant. We may hear of the government approving the increase in price by part of the banking industry, but the administration will be highly criticized. During this period, women will not benefit, and those who seek going into litigations should be careful. People will want to seek better wellbeing, and we will see an increase of those who will want to go to the South and the Southeast of the US. However, the year will not be good for the President and for the people. We find Mercury retrograde, but in its exaltation, which indicates the lack of fortune among sales people and accountants, and we will see a lack of business ventures and the unfortunate positions of astrologers or we will hear of the death of a well-known astrologer, this will happen between October and January. People will use lies and treacheries and give false testimony, and there will be injustice in courts. Man will continue to lose faith in his religion and its leaders and they will not hold them in esteem and will seek naïve and ignorant things. Men will commit fraud against his associates, and dispose of their riches and women will be unfaithful to their men and take away their riches. We will continue to see an increase in divorce cases. We will hear about men abusing of children and men that abandoning their wives, if they are older than they are, or children abandoning their mothers. The people will be rebellious, especially in the Southeastern part of the US, and they will not have pity, nor will they obey the law, but we will see much of them poor, envious, and harm will come to others. People will seek magic and rituals in order to increase their wellbeing. However, beware of the request one makes, because men will seek black magic and witchcraft to find success in his endeavors. Accountants will feel unfortunate, and their businesses will lose financially. The Gay community will benefit during this period and they will advance in their request. But men will commit crude acts and we will hear of sodomites and shameful acts that community will feel repulsive. We will hear of death because of snow storms. We will hear of fires in the North and NW of the US, destruction, and floods. This may commence sometime in November. The people will see an increase of diabetics, and pancreatic disorders, liver problems and an increase in intestinal, liver and pancreatic cancer. We will also hear of an increase with problems with feet and ankles. They will suffer of stomach problems and colic’s or gastrointestinal problems. The government must be alert, since we will see an increase of mosquitoes, flees, and bugs and this could go out of control. Women will have difficulties with childbirth. Hospital will decrease their services and we will hear that they are getting into problems. The US will see a diminish in their agriculture, awakening concern of future food shortage. They will look at, [farmers] associating with others to reduce cost. We will hear of lost of good harvest. After September, we will hear of police officers being killed, especially in areas such as the Northeastern and Southeastern part of the country. Crime rate will increase, in areas such as the Northern and Northeastern part of the US. An increase in robberies and stolen cars. It will be a bad year for the judicial and we will most likely hear about those who make the law, being investigated. Jails will see much harm and evil, as crime continues to escalate. During this period, one must be prepared, we will hear of strong winds, and lost of harvest, especially in the South, Southeast and Southwestern of the US. [Those ruled by Virgo] These winds will bring death to the population during the month of October and November, landslides, lost of homes, and this will be seen more so in the South and Southeastern area. During the coming month he will feel abandoned, and scared over the decisions he will be making. Legal issues will arise, and hidden enemies will increase against him and the people will not favor him, but the people will continue to support the President. Groups will stand against the President, they will be disobedient, and we will see fights and conflicts between his vassals. 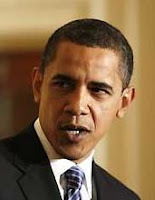 The President will be criticized because of his position on education. Important men will go against the politics presented by the President, but he will prevail over them. Danger will surround the President during this period and he will be feared, but not all that he desires will be accomplished. With his fridarias commencing in Mars, his areas of concern will be his career, honor and reputation, and how he is perceived when he communicates. When we look at his Solar Return, we can confirm his concern as to how he communicates; his X house is in his III house of his Solar Return, and his Ascendant is in his VI house of his Solar Return, he will be concern about his work. Saturn is in his Solar Return Ascendant in Virgo, and being malefic, in does not promise that he will accomplish his goals. The Moon is VOC and slow and this signifies futility and annulment and that he will be turning back on his promises and that their will be impediment, and being slow also confirms the slowness of his decisions. With his natal VIII house in the Ascendant of his Solar Return, we see continued conflicts and concerns, and those concerns will be about him. His hopes will be about his stability and his job and how he achieves his goals, but he will not accomplish much during this term of his Solar Return. His chart confirms what we see in the mundane chart. His cabinet will be favored, but during the month of September through February he will lose two Secretaries’, one will be requested to resign by the President. Judges and jail administrators will not be favored during these coming months. During this period, his Secretaries will be benefited by the justice system, and they will achieve what they want. The US soldiers will have a bad year and we will see an increase in death. We will see disputes, uprising and hear about rumors of war or wars in countries such as; North an Western Africa, Algiers, China, Eastern Hurasan, Lesser Armenia, and Azerbaijan. Israel: It will be a difficult year, the economy will see a decease. The Prime Minister will not fulfill the expectations of the people. Paraguay: Strong fires in Paraguay, floods and destruction. Iraq: We will see an increase in war, it is a far cry of leaving a country under control. The President will find himself in danger. We will see this during the month of September and December. Los Angeles: A very difficult year economically, but we may also see a earthquake in October. Sahl The Fifty Judgementes-Judgement X – Translated by Benjamin Dykes Phd. Sahl The Fifty Judgements XVI – Translated by Benjamin Dykes Phd.